Fall favorites are waiting for you at 7a. Let’s call it fall already, folks. The season of nostalgia. While I love the leaves, the wind, and the scene of it all, I hate being sentimental. I don’t know what it is about this season, but it always gets me feeling like it’s the first day of kindergarten and I’m walking to the bus stop in my new jeans and Skechers, holding hands with my mom and dad. Fall is an ode to the simpler days. Of course, everything is simple when you’re 6. Your mom packs your lunch, which for me, was always a couple of ginger snaps, pistachios, raisins, and a peanut butter and honey sandwich. But since life is more stressful and complex now, I eat food with the same amount of fortitude I need to face my day. This means the food is more sophisticated, and, in general, there is more of it. There are two instances when I actually feel like having a sandwich. When there is nothing else or when I can eat it with hot soup on a chilly day. Last Monday, the weather was enough to get me in the mood. And the windy autumn-scented drive up State Road was enough of an excuse to get me up-Island for a soup and sandwich at 7a. When it comes to food, I’m annoyingly indecisive. I meant to think about what to get on my way up, but of course I was caught up in the weather. The beauty of this season makes me think too much. Words and wise thoughts seem to fall right off the trees with the leaves and blow right into your path. By the time I got there, I realized I was too busy contemplating philosophy to think about the menu. Rather than risk looking like a rookie, I made the snap decision of going with the recommendations of others this time around. 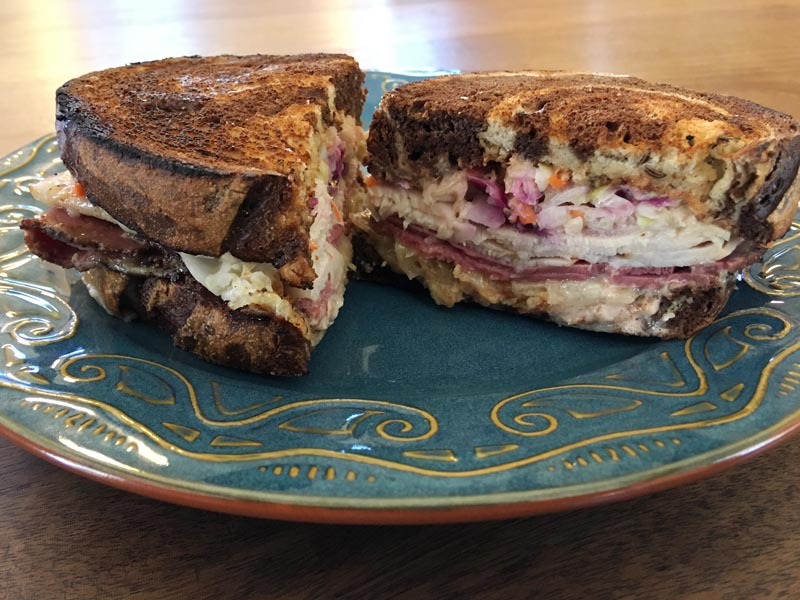 I ordered the Liz Lemon ($10.95), their most popular sandwich, which includes pastrami, turkey, Swiss cheese, coleslaw, Russian dressing, and crushed-up potato chips on rye bread. This is what I meant by complex food. It comes from “30 Rock,” the TV show, and it is named after the character who invented it, played by Tina Fey. The potato chips are great for a crunchy texture, and enough to make this sandwich something special. It was delicious. I even ate the crust. I also got the Curried Lentil Soup ($6.95), which is made with Mermaid Farm yogurt and cleverly topped with cilantro. A really excellent choice — I hereby pass on the recommendation given to me, to you. You don’t come by amazing takeout very often, but it’s right there at 7a, which, lucky for us, is open through the off-season Monday through Saturday, 7 am to 5 pm. During past treks to 7a, I ate my lunch on the way back to the office, in my car, while driving. It’s not the safest measure to take, but I firmly believe it’s part of the takeout experience at any place. How can you not? Otherwise the food is just sitting on your front seat, smelling great and getting cold. Besides, I used to do it all the time before I lived on an Island that has no drive-through restaurants. This time was much more civilized, because I waited until I got back to work to eat it. Just as good, but not quite as fun. Since it’s officially fall now, I wanted to write an ode to the Soup and Sammie, two things I can only really enjoy at this time of year. Whether I’m driving with my elbows down a tree-lined road, spilling potato chips and soup all over my sweater, or munching quietly at my messy desk. I love you very much.